More and more business and IT executives are looking to the Internet cloud to improve business agility and lower costs for delivering corporate Websites and applications. But the cloud is comprised of a myriad of networks and ISPs that have many bottlenecks that can impact performance, availability and security. The cloud is only getting more complex, with a growing surge in mobile device use for Web access and an increasingly sophisticated threat environment. 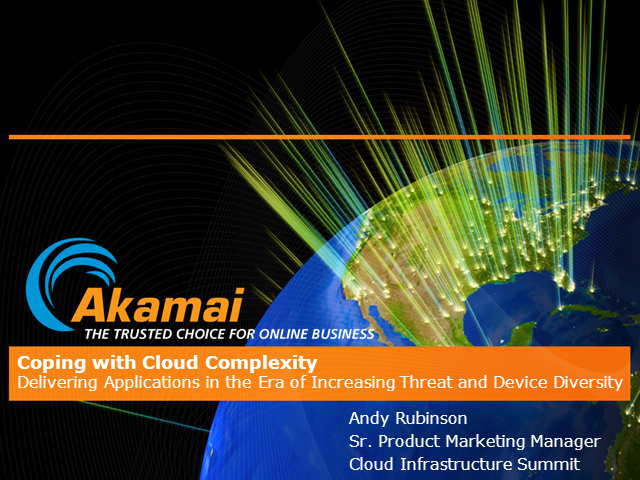 Join us for this session to learn strategies for leveraging the cloud itself to help you manage this complexity – defend against threats, optimize delivery to multiple devices, and improve performance, availability, and scalability.